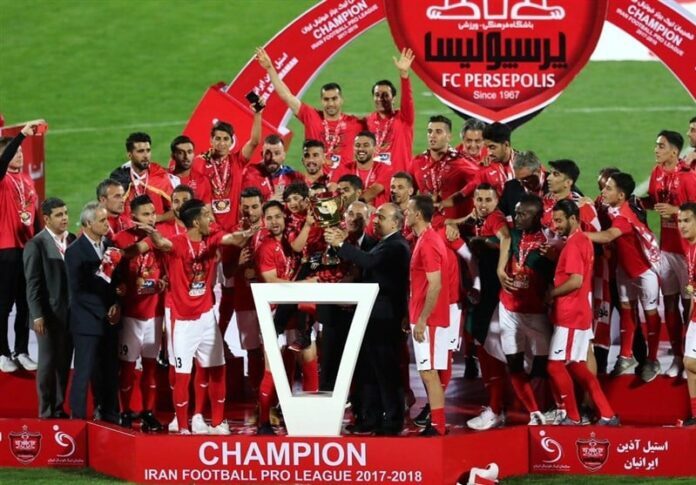 Persepolis football team lifted Iran Professional League (IPL) trophy at the end of Sepidrood match in Tehran. On Friday, the Reds celebrated their 11th title in Iranian football league in Tehran’s Azadi Stadium. Persepolis defeated Sepidrood 3-0 in the IPL last week. Mohammad Ansari opened the scoring for Persepolis from a set-piece in the 31st minute. Farshad Ahmadzadeh was on target in the 48th minute and Kamal Kamyabinia opened the goal with a header in the 87th minute. Iranian Minister of Sports and Youth Affairs Masoud Soltanifar attended the celebration. Earlier on the day, Zob Ahan became vice-champion after defeating already-relegated Naft Tehran at the Takhti Stadium. Esteghlal finished in third place, defeating Sepahan 1-0 in Isfahan. Ali Daei’s Saipa, who came fourth, beat Paykan 2-1, Tractor Sazi edged past Foolad in Ahvaz, Sanat Naft was held to a 3-3 draw by Esteghlal Khuzestan, Siahjamegan, who was relegated from IPL, lost to Pars Jonoubi 1-0 and Gostaresh Foolad played out a goalless draw by Padideh.